DownWithTyranny! : Are You Hardwired To Be A Liberal Or A Conservative? Are You Hardwired To Be A Liberal Or A Conservative? 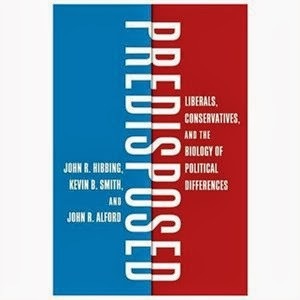 I'm thoroughly enjoying Predisposed by John Hibbing, Kevin Smith and John Alford, which explores the biology of political differences between conservatives and liberals, and which I mentioned the other day in terms of understanding why the Carl Sciortino ad was catapulting him to the front of the pack in his congressional race. I'm sure we'll be looking at the book in more detail in the coming weeks. Meanwhile, though, the publisher was kind enough to send me the Left/Right Twenty Questions Game, which I thought you might enjoy playing this weekend. 1. Could you slap your father in the face (with his permission) as part of a comedy skit? 2. When you go to work in the morning, do you often leave a mess in your apartment or house? 3. Which lesson is more important to teach to children? 4. Do you get bored by abstract ideas and theoretical discussions? Which answer is closer to your current thoughts? a) Okay…makes sense b) What??? Which item from each pair comes closest to describing you? If forced to pick only one from each pair, which would you prefer? Are you closer to agreeing or disagreeing with the following statements? 16. Some people are just more worthy than others. 17. If people were treated more equally we would have fewer problems in this country. 18. To get ahead in life, it is sometimes necessary to step on others. 19. In an ideal world, all nations would be equal. 20. It's probably a good thing that certain groups are at the top and other groups are at the bottom. Score +1 for each ‘a’ answer on questions 4,5,7,10,11,13,15,16,18,20 and +1 for each ‘b’ answer on questions 1,2,3,6,8,9,12,14,17,19. A total score of zero is the farthest left, a score of twenty is the farthest right, and a score of ten is middle of the road.